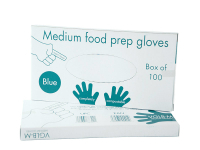 Disposable, made from compostable starch based film, great for food preparation. 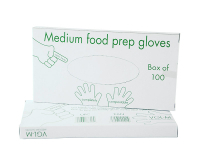 Friendlypak disposable gloves are particularly suitable where hygiene is important. Personal hygiene & handling messy situations is made safe and easy without guilt using friendlypak disposable Gloves. They are produced from special ‘soft feel’ compostable starch biopolymers that ‘breath’. A high moisture transmission rate makes them superior to other products as the plant-derived film is more comfortable & does not ‘sweat’. Moisture resistance however is still high enough to make them fully serviceable, after use no cleaning is required, they should be disposed of into the organics waste stream, dirt mess and all, for composting or worm farm. We hope to have Small and Large again in the future. Specifications: Disposable, main component starch. Certified compostable to international standards including: EN13432, ASTM D6400, ISO14855 (17088), JIS K6950/6951/6953.